Sizing hints: I've got big hands for a lady so mine is sized at 65mm diameter and is the "Large" demo model at the link above; that's probably the average man size for this bracelet. I'd wager that average woman size is 60mm, which is "Medium" at the link above, and that average child's size is 55mm, which is "Small". But you can size it however you like in the Customizer link, and make whatever works for you! Settings: Printed on a MakerBot Replicator Mini with what from now on I will call ".3 vanilla", by which I mean Standard settings with raft but no supports, and all options at default except for bumping layer thickness up to .3mm. Although I now know how to deal with this, I wanted to make some bracelets that people could print right away on whatever machine they were on, and even if they were beginners. 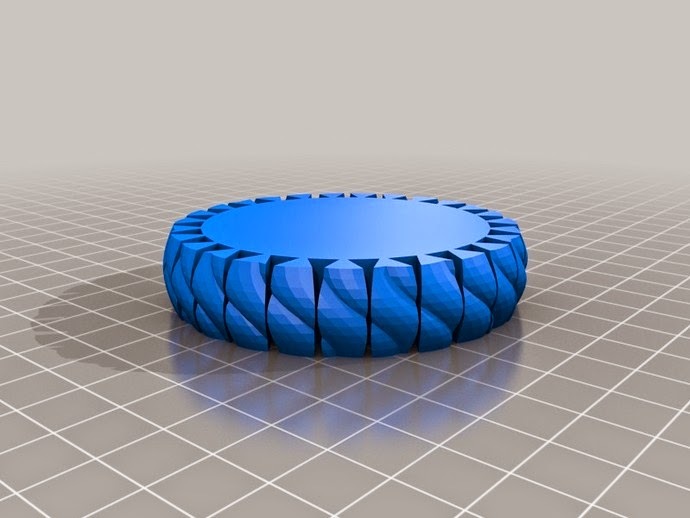 Another reason I wanted to move away from the printing-shells-of-hockey-pucks method is that when I remove infill, floor, and roof to print such a bracelet, my machine prints a raft all across the inside even though there is nothing to be printed there. This leads to a lot of wasted plastic, not to mention wasted time. It took a while for me to figure out how to reliably construct a bracelet shell, and in the end of course it came down to some math! The sine function moves up and down in a wave that is controlled by the numbers in the expression. The multiplier 3 determines the frequency of the graph, that is, the number of times the graph makes a full up-and-down cycle as we move from 0 to 2*pi. Normally the sine function would have heights varying from -1 to 1, but the "1+" in the function above shifts things up so that the graph instead has heights between 0 and 2. The constant multiple of 4 determines the graph's amplitude, which is the vertical distance from its center to the top of its peaks; the graph of 4(1+sin(3t)) would have heights varying from 0 to 8. Finally, the 60 determines a shift upwards 60 units, which is why the graph above has heights varying from 60 to 68. To wrap this curve around a circle we create a parametric curve whose first coordinate is the function above times the cosine function, and whose second coordinate is the function above times the sine function. Think of it as a weighted version of the parametric curve (cos t, sin t) that traces out the unit circle, with our function 60+4(1+sin(3t)) providing the "weight" on the two coordinates, pushing the shape in and out. Technical notes, OpenSCAD flavor: The code for the TRI bracelet uses the module function_trace to trace out the parametric curve we discussed above. Specifically, function_trace creates a series of tiny circles along the parametric curve and then connects adjacent circles. The diameter of the circles is determined by the thickness parameter. The resulting 2-dimensional shape is then extruded with linear_extrude while twisting 30 degrees. In the Customizer you can enter your own custom values for thickness, diameter, and height to size and style the TRI bracelet. UPDATE/CORRECTION: In the WolframAlpha images above, I should have used a translation of 30, not 60, because RADIUS IS NOT DIAMETER SAY IT WITH ME NOW.